Iraqi born Arab artist Kadim Al-Sahir has reshaped the face of Arabic music today. He paddled against the prevalent current and founded his own distinguished and sophisticated artistic line. He’s an innovator who creates his music from within. The outcome is hard to define into an existent music category. His music is not fully classical nor completely folkloric nor pop-oriented. His music is more a one and only Kadim style of music. Today, the distance between Iraq and the United States is as great as that between the rival clans in Shakespeare’s tragedy, which as we know was not only about love. Kadim has played major US concerts in some of the nation’s most distinguished concert halls, to Arab and non-Arab Americans audiences who had an opportunity to experience Mr. Sahir’s music, distinguished tenor vocals and his majestic 35-piece orchestra in concert. ? Kadim Al Sahir was born on September 12, 1957 in a city called Mousel in northern Iraq. His father a Sunni Arab from the city of Samaraa, his mother Shea Arab from Al Najef had ten children. Sahir’s father worked in the local palace, although his government wage did not make him a rich man, he always claimed he had more valuable treasures, being blessed with a healthy, talented and beautiful family. Kadims’ father retired from his government position in the early 60’s and moved his family to Baghdad where he started a small furniture repair shop and Kadim use to help him during his summer break selling ice cream. The youngest of eight brothers, Kadim took a keen interest in classical music as a boy. He sat by the radio and learned to sing works by masters like Mohamed Abdel Wahab, Abdel Halim Hafez, Nazim Al Ghazali, and Fairuz. At age ten, he sold his bicycle to buy his first instrument, a guitar, but after a year of study on guitar, he switched to the oud, the principle composers’ instrument in the Arab world. Kadim wrote his first song at twelve, a romantic piece in the classical style, composed for a girl he liked. Kadim entered the Height Institute of Teachers to gain his teaching credentials and upon graduating he proceed to teach at a primary school in northern Iraq. A few years later he came back to Baghdad to further his education in music studies enrolling in the prestigious Institute of Fine Music. Completing six years of study in Iraq and a battle to enter Iraq’s tightly controlled music industry the essence of Kadim’s art was already established.? At the time Kadim entered the Institute of Fine Music, now 21, the 1980 Iraq-Iran war had started. The future looked uncertain. “Of course, my family worried,” he recalls. “They would have preferred that I become a doctor or a lawyer. I was very good in school, so they thought I could take on a profession. But my mother was in my corner for music. She always encouraged me.”? ?Sahir studied Arab and Western classical music along with Iraqi Maqam, and Iraqi folklore. All the while Kadim continued to compose music and develop is his own signature style. However, when presenting his compositions to the Radio/Music/TV producers who controlled the all-important outlets of radio and television in Iraq they refused to help him with getting his music to the public. “I would go to music promoters and they would say, ‘We’ll work with you but only if you sing our songs, or well know standard songs of Arab the world. Other young artists had wealthy backers, but Kadim could scarcely afford the bus fare to go and visit these promoters, let alone to bribe them. Kadim got his first break at 26 when a keyboard-playing friend from the institute introduced him to a television director. Without getting permission, they went to a small village outside Baghdad and shot a music video for one of Kadim’s songs. When they slipped it into the broadcast, the song made a sensation all over Iraq and around the Gulf. “The song was called ‘Ladghat El Hayya,’ (The Snake Bite) the music by Sahir and the lyrics by Aziz Alrasam. Kadim recalls, I wrote it the year that Iraq-Iran war ended in 1988. It was about someone who has been threatened and prevented from proceeding, someone who is afraid.” The television producers were naturally impressed with Kadim’s reception by the public, but not with the words to his song. They gave the young artist a choice: change the lyrics and rerecord the song, or else they would ban it. Kadim refused to change his song. Predictably, banning the song only made it more popular. Requests for collaborations and concert appearances began to come from around the Gulf, and in the brief interlude between Iraq’s two recent wars, Kadim launched his career in earnest. The producers of a nighttime television soap opera called Nadia and the song was written by the famous Iraqi song writer Kareem Aliraqi )gave him his next break when they used his music in the program’s title song. The show’s popularity blossomed, and Kadim began recording for record labels in Kuwait as their was not any record companies in Iraq or Iran. In 1988, Kadim’s final year at the Music Academy, he composed a hugely successful pop song called “Abart Al Shat” (“I Crossed the River”). Some of the more conservative professors objected and tried to get Kadim expelled from the school for composing lowly “contemporary sha’abi” music. But now Kadim had defenders, professors who recognized his extraordinary gifts as a composer, and he completed his degree. In December of 1989, Kadim performed his first concert outside Iraq in Kuwait major concerts in Kuwait and also the United States, filled with Arab audiences. In the television studio, Kadim met Aziz El Rassam, the first of many prominent lyricists he would compose with over the years. Rassam wrote lyrics for eighteen of Kadim’s early songs, including “Obart Al Shat.” The two proved as effective a team as Lennon and McCartney. In 1990, Kadim teamed up with the Cairo Symphony to record “La Ya Sadiki” (“No, My Friend”), a fifty-minute opus that established him as a major contemporary composer, although its length and complexity confounding radio programmers. “I did this for myself,” says Kadim. “I would rather write a symphony or a concerto than a five-minute pop song. I wanted to prove that I could do it as well as the masters.” And he succeeded. Critics have even credited him with reviving certain maqam (Arabic scales) that had fallen into disuse by modern composers.The Gulf War proved a major obstacle for Kadim’s burgeoning career. “For two years, I couldn’t do anything,” he recalls. “I couldn’t even travel to the Middle East, only to Jordan, where I lived during that time.” As in the Iran-Iraq war, Kadim had lost friends including his best friend Thaeer during the war to the fighting, and this period still holds dark memories for him. Later, he would sing about the pain of the sanction on Iraq war and especially its effects on children in the song “Tathakkar” (“Memory”), with lyrics by poet Karim Al Iraqi. ? Back in 1993, Kadim met Syrian poet Nizar Qabbani and began perhaps the most important artistic collaboration of his career to date. Prior to his death in 1998, Qabbani wrote lyrics for some 30 of Kadim’s songs. Having once created poems that were sung by the legendary Um Kalthum, Qabbani contented himself during his final years writing lyrics exclusively for the young Iraqi singer he considered “the son of his heart.” ? In the late ’90s, international honors and accolades rolled in for Kadim. He performed a charity concert at London’s Royal Albert Hall. He received the UNICEF award in England for the song “Tathakkar” and in 1999, he performed the song in the United States before members of congress and UN diplomats. 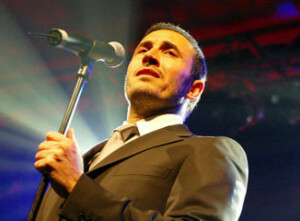 “Tathakkar” was then recorded in five languages and released along with “Al Amal” (“Hope”), Kadim’s anthem to optimism in the face of turmoil. At Christmas of that year, Kadim performed and recorded a tribute to the Pope. With the National Italian Symphony and a choir of children, he performed “Al Amal” and also “Ya Albi” (“My Heart”) a song he composed especially for the occasion.? At last, Kadim earned the attention of an American record label, Ark 21/Mondo Melodia, owned and operated by Miles Copeland. Copeland recruited a new president for his label, an expert on world Arab/ North African music, Dawn Elder. Keen to establish the label’s credentials as a leader in Mediterranean and Middle Eastern music, Elder promptly signed Kadim Al Sahir for an American label release of the “Impossible Love” in the US. This followed her success with Algerian rai singer Cheb Mami, the song/tour collaboration with Sting on “Desert Rose,” As Kadim’s fame has spread, he has been faced with constant pressure to modernize his music with electronic drums and synthesizers. He has experimented with this direction in Cairo, but the results have only strengthened his steadfast belief in live musicians. In 2002 he recorded duet recordings with Sara Brightman, “The War is Over Now”, and with Lenny Kravitz, and Simon Shaheen on “We Want Peace. In 2004 and 2005 Al Sahir continued to work with several renowned International artists including Grammy Award winning producers KC Porter, Dawn Elder and Quincy Jones. His latest collaboration ” Love & Compassion, Hob Wa Haneen” was the title track for the National Arab American Museum Collectors edition honoring the artists that have made the most significant difference with International audiences. The track features Grammy winning Singer/ Songwriter Paula Cole, Def Jam Recording Artist Karina Pasian, along with a host of celebrity musicians including Luis Conte, produced by Dawn Elder and KC Porter. Kadim says he is open to fusing his classical idioms with dance pop as long as it holds the integrity of the Arab music and rich traditional rhythms and patterns. But he insists that synthesizers will never replace the splendid string and brass players and the percussionists in his ensemble. The American audience represents a new challenge for Kadim. He hopes that listeners will discover that Iraq, a country they mostly associate with intransigence and war, has also produced some of the world’s greatest philosophers, poets, composers, musicans, and artists. Kadim Al-Saher is known to be Iraq’s Ambassador for Peace. Although it became necessary for him to live outside his country since around the mid 90’s if he was to pursue his music career to its fullest possibilities his beloved city Baghdad and fellow citizens in Iraq were always in his mind and soul and he fought through music for their salvation. When we hear of Iraq, the first thing that comes to mind is war. It’s a shame that this great country has been reduced to a war zone. Through his songs and music, Kadim Al-Sahir reminds us that this country is one of the first great civilizations and is about love, poetry, music and the home of great legends. Kadim speaks often about his country, however a listener could easily confuse his words and not connect it to a place but a great lover. He sings about Baghdad you feel as though he is singing to the greatest love of his life. He says Baghdad is my love who taught me how to speak gently, think carefully, feel others feelings, and how to respect and love everyone. One of his most wonderful songs about Baghdad is “Kathur Alhadeth”, lyrics by Kareem Aliraqi which were later translated into several languages. Kadim Al-Sahir, with his songs, evokes listeners to love Baghdad and dream of her happy face not only in the Arab World but around the entire planet. Kadim performs all around the globe with his talented Iraqi Orchestra made up of some of the finest musicians in the Arab World he has recorded many of his songs backed by renowned orchestras such as the Italian Symphony Orchestra, the Los Angeles Philharmonic Orchestra, the Turkish Symphony Orchestra and others. Also notable to mention is that Kadim Al-Saher song “Kathur Alhadeth” (usually titled “Beauty and Love” in English) has been studied at Ohio State University as a basis for a multimedia introduction to the cultures of the Middle East. Kadim Al-saher and his concerts has also been the subject of articles in the international press wherever he tours. To mention a few, Kadim was featured in American newspapers such as the New York Times, The New York Post, The Los Angeles Times, The Chicago Tribune, San Francisco Chronicle, Herald Times as well as International various magazines such as Song Lines, Global Rhythm and Enjoy the Music Magazine. Articles about Kadim’s concerts and songs have also been written in Reuters, AFP (France), U.K.’s Hello Magazine, Uruguay’s El Pais, Malaysia’s The Star, etc. In addition to his yearly concerts in the Arab States, Kadim Al Sahir has toured the North America, Europe, and the UK and has been hosted more than once in the Royal Albert Hall. His last performance early in 2005 was a complete sell out with all the net proceeds donated to help the children of the Middle East affected by the devastation of war. He also performed on many internationally renowned stages such as the Sydney Opera House and New York’s Beacon Theatre in addition to many other countries around the world. In year 2004 he participated in world wide special broadcast concert special “We are the Future” Concert produced by Quincy Jones in association producer Dawn Elder at the Roman Maximos Stadium in Rome for the benefit of the children of the world. The Special was aired world wide, and will release on DVD June 13th. And in December 2004 he participated in the opening of the Gulf Football Championship (Khaleeji 17) in which he performed the return of Iraq Operette which was broadcasted live on 10 satellite channels. Additional in 2004 he was the first Arab artist to participate in the Official Album of Athens Olympics. After the Gulf War, Kadim moved to Lebanon, and today he divides his time between France, Canada, Doha, Dubai and Cairo where he does most of his recording. He recently participated in a unique interdisciplinary project at Ohio State University. The program uses a multimedia environment to introduced students to Middle Eastern cultures through contemporary songs. Kadim created the flagship module, a celebration of his favorite city, Baghdad. He is currently working on his latest album in New York that he hopes will shed a light of hope and love to his beloved country and people.. It is a Classical album that returns Kadim to his roots.. Ironically, Kadim has not been able to visit that city since 1997.